The tongs are designed of lightweight aluminum alloy, exceptionally strong, yet they will “disintegrate” if caught between dies. The Tongs are efficient in gripping and separating metal or plastic sheets. The Vacu-tongs are two tools-in-one and allow easy positioning and handling raw stock with speed and ease. Stainless steel springs are guaranteed for the life of the tools. Capable of carrying much greater loads than 2 men can carry. Ideal for moving heavy gauge metal, marble slab & heavy plate glass, plastic sheets. Part number: 62018 2 cups 4” dia. Ea. Part number: 62019 2 cups 5” dia. Ea. Lifts heavy loads safely. 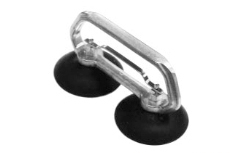 Powerful suction cup grips material and holds until released by hand trigger. Use for loading, unloading piling and shifting sheet metal. The vacuum created by two cups allows easy lifting of heavy weights with either one or two hands. The suction is broken only when the finger-tip operate release bar is lifted. One finger lifter fits snugly in one hand. No metal parts all rubber composition can lift surprising variety of material. Available with or without release tabs. 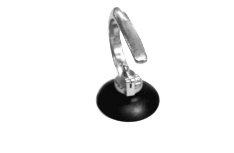 No metal parts all rubber composition, two-finger style assures secure handling for lifting medium size parts. Convenient release tabs allow easy vacuum release. 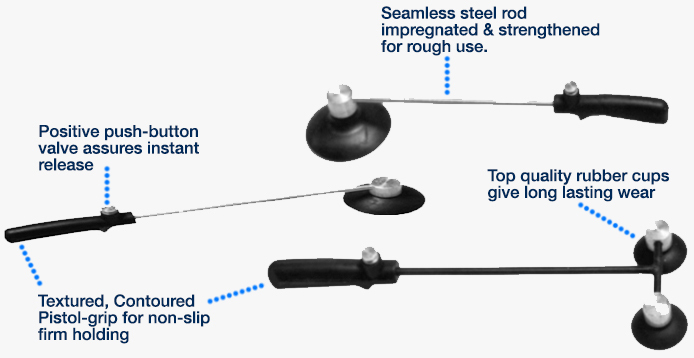 Combination grabber and lifter combines the flexibility of a grabber with the holding strength of a lifter. Just lift lipped edge to release vacuum. Lifts 50 Lbs.